From its official launch in October 2009, it took Windows 7 only nine months to pass Vista. Now the next question is when it will catch up with Windows XP. Because, unbelievable as it may seem, Windows XP still has a massive 55% of the desktop OS market. That is more than Windows 7 and Vista combined. To figure out when Windows 7 will overtake XP, we have made a prediction based on the average market share changes over the past six months. It will give us an idea of what will happen if things continue at their current pace. Please note that everything past August 2010 in the below graph is an estimate. The data until today is actual global market share data from Statcounter. We have marked the dates when Windows 7 caught up with Windows Vista, and when it will catch up with Windows XP if the current trend continues. Windows 7 will overtake XP by the end of 2011. Windows Vista may die out sooner than Windows XP, in spite of being a much younger OS. We based our prediction on past market share data, but that is of course a simplified view of something that depends on a number of factors, many of which change over time. One major factor that may speed up the adoption of Windows 7 and the decline of Windows XP is Microsoft itself. The company is actively discouraging the use of XP and is trying to speed up its demise. We suspect these efforts will escalate the longer XP is able to hang on to a large share of the market. Something else to take into account is that corporate users tend to wait at least a year before they migrate to a new OS, so we may see a speed-up in Windows 7 adoption late in 2010 or early 2011 as the corporations start to jump aboard. Since many of them will be migrating from XP, not Vista, this may speed up the decline of XP even further. 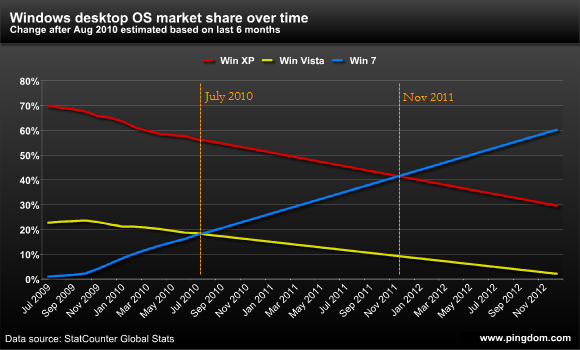 We were right about when Windows 7 would overtake Vista, but that was a much easier thing to predict. If the above prediction holds true, however, Windows 7 will become the dominant version of Windows roughly two years after its launch. Perhaps it’s finally time for XP to retire? Market share data source: StatCounter (only the historical data, not the prediction).